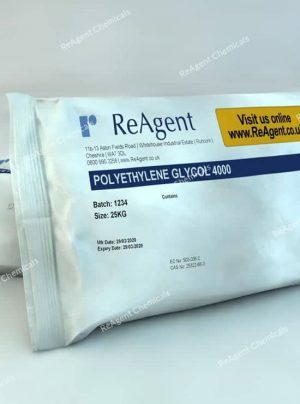 Where Can I Buy Polyethylene Glycol in the UK? 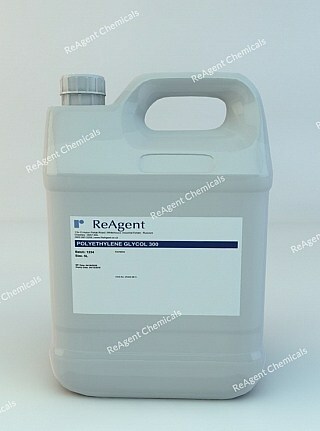 ReAgent is one of the leading chemical suppliers in the UK. With over 40 years' experience, we manufacture and supply high-quality polyethylene glycol (PEG) in a range of batch sizes and concentrations. Buy online and choose from PEG 300, PEG 400 and even PEG 400 with discounts available on bulk orders. All of our products are 100% quality guaranteed and delivered to your business with ADR licensed couriers. If you would like more information on what ReAgent can do for your business, contact us today and speak with a member of our expert team. 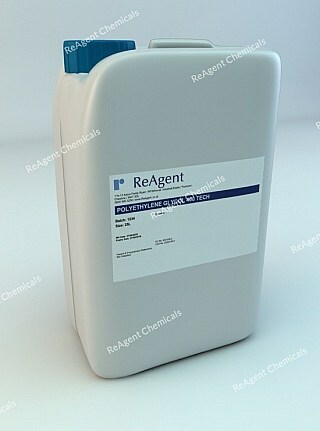 ReAgent sells Polyethylene Glycol in containers of 25 litres up to a container of 205 litres. Precautions must be taken at all times when handling chemicals. For more information, please refer to our MSDS page. Polyethylene glycol (PEG) is a polyether compound and refers to a polymer of ethylene oxide. Depending on the molecular weight of the substance, polyethylene glycol can be known as either polyglycol, polyoxyethylene (POE) or polyethylene oxide (PEO). While this substance is insoluble in solvents like diethyl ether or hexane, it is soluble is solvents like benzene, methanol and water. What is PEG Used For?